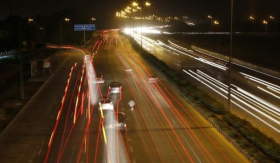 On the roads, about one in five vehicles worldwide will have some form of wireless network connection by 2020. FRANKFURT (Reuters) -- Traffic jams in the future could cause potentially dangerous data snarl-ups as cars packed with entertainment, safety and navigation features vie for airwaves with smartphones, tablets and networked features in other vehicles, according to a study. By 2024, mobile networks will see machine-to-machine connections jump 10-fold to 2.3 billion from 250 million in 2014. Half these links will be automotive, said the study published on Thursday by Machina Research. Connected cars with onboard Wi-Fi connections could cause spikes in cellular data demand when traffic grinds to a halt as drivers seek alternative routes and bored passengers search for entertainment on phones and tablets, the Machina study says. It says car navigation and collision detection systems that rely on local networks to identify obstacles could then become strained, if they are not carefully designed and regulated. "In terms of overall data volumes, connected cars don't present much of a problem," said Matt Hatton, founder and CEO of Machina, a British market research firm specializing in machine-to-machine data communications. "But network resource management is not based on total traffic volume. It's based on particular cell sites during peak times of network use," Hatton said of the antennas and equipment used to transfer mobile calls and data to and from a local area. Peak traffic in rush hour could double in the immediate vicinity of congested areas due to the electronics on board connected cars, Machina estimates. Already, most drivers stuck in traffic jams expect mobile phone coverage to drop out from the sheer volume of callers who suddenly find themselves bumper-to-bumper. Less noticeably, phone users in densely populated areas can see superfast 4G data connections drop to slower 3G links or even 2G connections capable only of limited data transfers. But while phones make minimal demands on a network until a user downloads a video, updates email or makes a call, network congestion multiplies when drivers converge in road traffic. The Machina report was sponsored by TEOCO, a Fairfax, Va.-based provider of network management services to major telecom network operators worldwide. Eric Auchard is editorial innovation director at Reuters News. He builds tools to help journalists at the world's largest news organization report, edit and present the news.